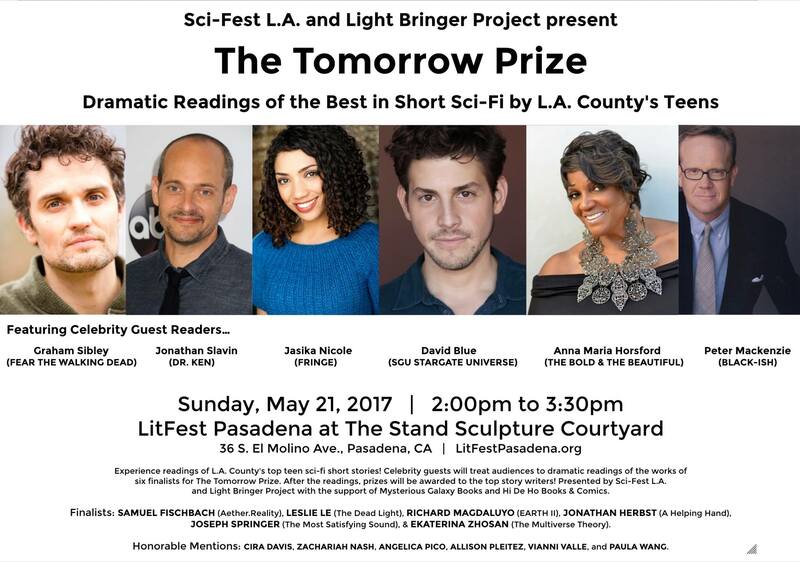 On Sunday, May 21 at 2 p.m., Sci-Fest LA will partner with LitFest Pasadena for dramatic readings of the Finalists’ stories for The Tomorrow Prize for short science fiction by L.A. County teens. The readings will happen in the Sculpture Plaza across from the Pasadena Playhouse – free admission, seating limited. Six finalists’ stories will be read by sci-fi celebrities, followed by an awards presentation. Honorable Mentions: Cira Davis, Zachariah Nash, Angelica Pico, Allison Pleitez, Vianni Valle, and Paula Wang. As some of you may know, in 2015, Actors Equity Association (the union for professional stage actors) took the unprecedented step of discontinuing the Los Angeles 99-Seat Theatre Plan — an agreement that had been in place for over 30 years. The plan had allowed LA-based Equity members to perform for free in small, 99-seat theatres in order to showcase their talents. 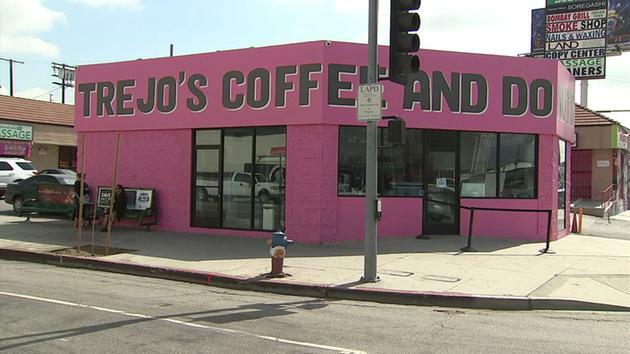 Although the local Los Angeles membership of Equity waged a very strong campaign to reverse the decision, the national council of Equity overruled them. 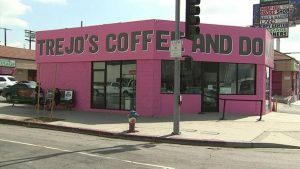 A lawsuit was subsequently brought against the union by a group of well-known actors including Emmy-winner, Ed Asner, but a few weeks ago, the suit was dismissed by federal judge in Los Angeles. As a result, the 99-Seat plan officially comes to an end as of today, December 15, 2016. This means no professional stage actor in Los Angeles can appear in a 99-Seat theatre without being paid minimum wage for every hour of work, including rehearsals, tech rehearsals, and performances. Under the former 99-Seat plan, Sci-Fest LA (which uses 45-60 actors each year) paid each actor a small “per-show” stipend. The producers say they say they are unable to meet the new demands. Consequently, Sci-Fest LA: The Los Angeles Science Fiction One-Act Play Festival will be going on hiatus for 2017. 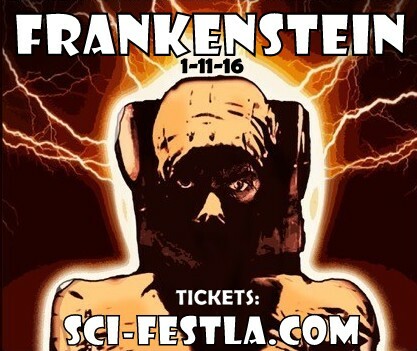 There remains a possibility that Sci-Fest LA may co-produce a full-length Sci-Fi themed stage play in conjunction with a well-established, “membership” theatre company in LA that is currently exempt from the Equity salary requirements. In the meantime, Sci-Fest LA will continue presenting its two sf writing contests, the Roswell Award and the Tomorrow Award. The winner of Sci-Fest LA’s Tomorrow Prize for the best sci-fi story written by a Los Angeles high school student was won by Matilda Berke for “Rock Star.” She won a $1,000 scholarship from US Bank. The award was presented at a ceremony on May 14 during which celebrities read all the finalists aloud to an audience. The contest judges were Gary Phillips (co-editor of the bestselling anthology Black Pulp), Jennifer Bosworth, (author of YA novels Struck and The Killing Jar), Joshua Dysart (multiple Eisner Award nominee, Glyph award-winning, New York Times Bestselling comic book writer and graphic novelist), Julia Mary Gibson (author of Copper Magic), Rosalind Helfand (a writer and organizer in LA’s literary community), Lissa Price (author of the Starters series), and Geoffrey Wood Patterson II (comic store owner). 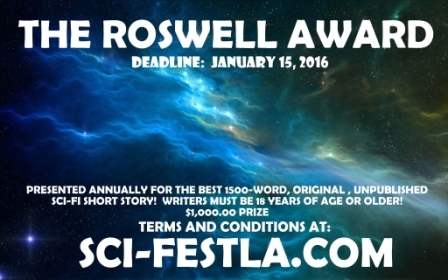 Entries for The Roswell Award, sponsored by Sci-Fest LA, The Los Angeles Science Fiction One-Act Play Festival, are being taken through January 15, 2016. 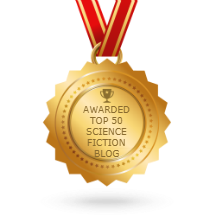 The Roswell Award was created to identify, encourage and promote up-and-coming science fiction writing talent, and is given to the winner of Sci-Fest’s short story writing contest for adults. 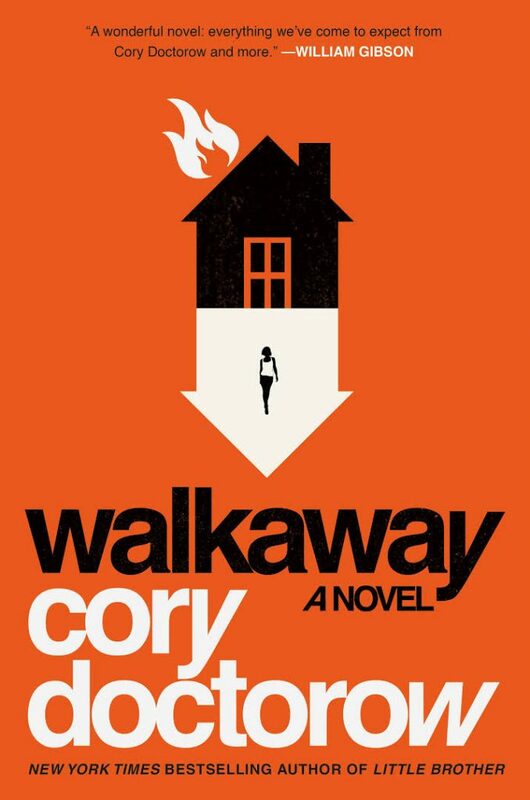 The author of the winning entry will receive a cash prize of $1,000.00. Entries must be original science fiction short stories (not plays), no longer than 1500 words, by a writer over the age of 18. 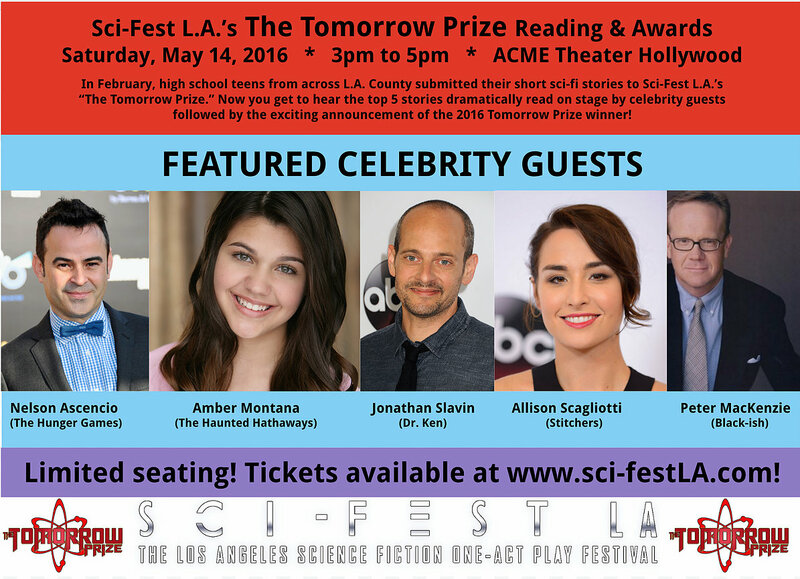 Five finalists will have their stories read aloud “by sci-fi celebs” at Sci-Fest during an awards ceremony in May 2016, then posted on the Sci-Fest LA website. 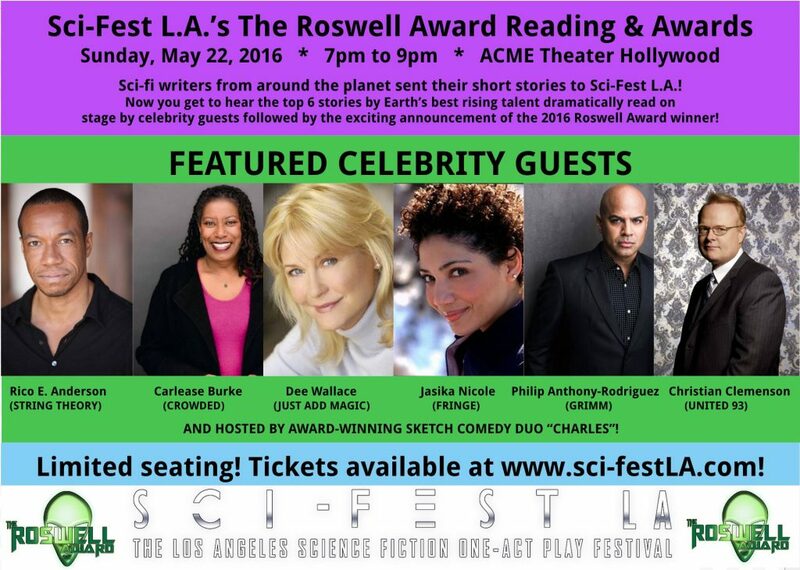 Finalists will receive two tickets to attend a Sci-Fest LA play festival evening. Full details at the website. 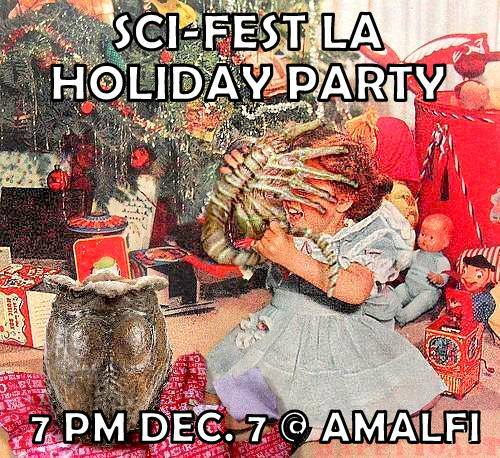 HOLIDAY PARTY: Sci-Fest LA also says all are welcome to join them at their holiday party on December 7 at Amalfi (LaBrea near 1st Street, next door to the Acme Theatre.) Cash bar. Starts at 7 p.m.